The best deal, the best value on customized or personalized latex balloons begins with...wait for it...really good latex balloons. Shocker, eh? But it's true. What does this mean, aren't all latex balloons the same? I mean it's a bag of balloons. Well in one way, yes they're the same. Or let's say they're similar. They are all just a film of rubber made when a form is dipped into a vat of liquid latex, then dried, washed a couple of times, dried, and bagged. But what's in this vat specifically? Is it a thin, weak, and watery mix, designed to get the most pieces of those little colored stretchy things out of a batch? Or is it engineered to make a stronger, thicker film of rubber? Are the forms that are dipped into this vat clean, or are they harboring dust or other foreign material? These are the "minor details" that make ALL the difference between a bargain balloon and a premium quality custom printed balloon. A piece of debris whether it's dust or some other object, clinging to a form that's dipped into a vat of latex will create a flaw in the balloon. You can actually see them sometimes when inflating. Because the film of latex isn't uniform and has this flaw it will break when you try and fill it. Of course, this happens to every brand from time to time. But the more careful the quality control, the less it happens. Yes the best custom printed latex balloon begins with the best balloon. Next step is to shop where you have the most choices from what is available in quality, color and style, not where they have choice A and choice B and nothing else. Many online sellers have one or two sizes and only a handful of colors to choose from. At Balloons Direct you'll find not one but two American made top quality brands, Qualatex and Tuf-Tex, with 10 different size options between them and over 100 colors. ALL of this at prices comparable to many no-name bargain balloons with an easy online ordering system. We've created the most intuitive online ordering experience for custom printed latex balloons on the web. We personally handle each order from start to finish with total customer satisfaction as our goal. We are balloon people. 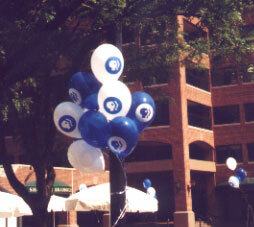 Inflatable promotional stuff is what we do.